are available for public viewing at the Valley Region Headquarters. To view the documents, contact the Water Manager, City of Los Angeles. The U.S. Army Corps of Engineers Los Angeles District released the draft Supplemental Environmental Assessment for the Sepulveda Basin Vegetation Management Plan for public review and comment. The public comment period officially ran from April 19 to June 15. For more info contact: kenneth.wong@usace.army.mil. A copy of the draft Supplemental Environmental Assessment is available on the District's website at http://go.usa.gov/czzp5. The Los Angeles Regional Water Quality Control Board (Los Angeles Water Board) has issued a 60-day notice of intent to sue the U.S. Army Corps of Engineers (Army Corps) for two unauthorized dredge and fill operations in Los Angeles County that violated the federal Clean Water Act and the California Porter-Cologne Water Quality Control Act. The Water Board is being represented in the matter by the California Attorney General's office. Click HERE to read the entire Finding of No Significant Impact for the Vegetation Management plan. Click HERE to read the letter sent to ACOE by the Sepulveda Basin Wildlife Areas Steering Committee. Click HERE to read the ACOE's response to the SBWASC letter. Click HERE to see ACOE's web page about this issue. Click HERE to read Daily News article about clear cutting of South Reserve. Click HERE to read L.A. Times article "Army Corps of Engineers clear-cuts lush habitat in Valley", HERE to read follow-up article. Click HERE to view YouTube video about the destruction. Click HERE and HERE to see Encino Patch articles with additional photos. Click HERE to read letter from San Fernando Valley Audubon Society about clear cut. Click HERE to read KCET blog by Carren Jao. Click HERE to read letter from State Senator Fran Pavley. Click HERE to read letter from State Senator Luis de Leon. Click HERE to view video entitled "Wildlife Refuge Meets Army Corps of Engineers" by a concerned citizen. Click HERE to read an editorial by Charles Miller on the KCET blog. Click HERE to read story in the LA Weekly. Click HERE to read Congressman Brad Sherman's letter to Colonel Toy. Regional Water Board Investigation - click HERE for Encino Patch article. Click HERE for Jan 13 update on the Sepulveda Wildlife Reserve. On March 19, 2013 the City Council passed the Sepulveda Basin habitat destruction motion authored by Councilmember Jan Perry. AD HOC RIVER COMMITTEE REPORT relative to the eradication and loss of habitats in the San Fernando Valley Sepulveda Basin. 1. INSTRUCT the Bureau of Sanitation and Planning Department, in coordination with the Chief Legislative Analyst (CLA), and in consultation with the City Attorney, the United States Corps of Engineers, the Audubon Society, Friends of the Los Angeles River, and any other pertinent entity, to prepare a report that explains the recent loss of 43 acres of bird, mammal, and reptile habitat in the San Fernando Valley's Sepulveda Basin without preparation of an Environmental Impact Report. 2. INSTRUCT the Bureau of Sanitation and Planning Department to include in the report if any endangered species were compromised, and whether there will be any detrimental impacts to air quality, and if any improvements were paid for with public funds or charitable contributions, and information as to which departments, if any, are responsible for overseeing projects that the Federal government is involved within City boundaries. 3. REQUEST the Commander of the Los Angeles District of the Army Corps, to present to the City Council their Vegetation Management Plan as well as a summary of additional community input they receive from follow-up meetings, and the results of the investigation of the loss of the 43 acres habitat. 4. REQUEST the Army Corps to work with the Bureau of Sanitation to come up with a collaborative agreement that meets the Army Corps' needs, the community’s concerns, and addresses the Regional Water Quality Board’s requests. 5. DIRECT the Bureau of Sanitation to act as the City lead, to provide support so that all interested parties can create a well received next phase mitigation plan. 6. REQUEST the Army Corps and the Bureau of Sanitation to come back with a plan within four to five months and provide a status report on the coordinated effort. Click HERE to view a "before" and "after" video of the Sepulveda Wildlife Reserve south. Click HERE for part 1 and HERE for part 2 of Jan 13 Sierra Club video hike through "cleared" area. Click HERE to find out about the history and wildlife of what used to be the South Reserve. Click HERE to visit the San Fernando Valley Audubon Society's web site that has recommendations as to who to send comments, and other links. The public notice is available at http://bit.ly/oYT26M. The draft Environmental Assessment is available for review at http://bit.ly/plxiK1. 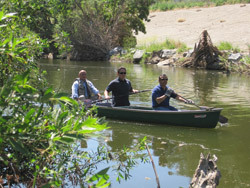 According to an article in the Los Angeles Times by Louis Sahagun (June 25, 2011) there are plans to launch kayak trips along the Los Angeles River. According to a Los Angeles Times article dated July 8, 2010 by Louis Sahagun, U.S. EPA Administrator Lisa Jackson declared the entire concrete-lined Los Angeles River channel "traditional navigable waters," a designation crucial to applying Clean Water Act protections throughout its 834-square mile urban watershed. (Click HERE for article). Previously, Dean Wallraff, of the Sierra Club Angeles Chapter Conservation Legal Committee, wrote an article in the August 2009 Southern Sierran entitled California Clean Water Law: Restoring Protections for Wetlands and Impermanent Streams. The article also featured a map of Permanent and Impermanent Streams near Los Angeles. The EPA Region 9 Office has prepared a two-page summary on the evaluation of jurisdiction and navigability on the Santa Cruz River, AZ and the Los Angeles River. The summary provides some background and outlines specific information categories for public comment. Cities along the watershed are required by 2016 to keep all trash out of their storm drains. Those that don't comply will now be in violation of the federal Clean Water Act. Regional water quality officials on Thursday put some teeth into their long campaign to cleanse the Los Angeles River system of the tons of trash that turn it into a movable landfill after major storms. Standards previously adopted by the Los Angeles Water Quality Control Board give cities along the watershed until 2016 to keep all trash out of their storm drains. On Thursday, the board incorporated those limits into storm water permits, putting municipalities that don't meet the requirements in violation of the federal Clean Water Act. Until now there had been no penalty for noncompliance. "It's taken two decades to get to this point," board vice-chair Madelyn Glickfeld said after the 5-0 vote. "If we hadn't done this today, it would have been a signal" to cities "to relax, guys." During storms, tons of trash and plastic debris wash up in municipal drains that empty into the Los Angeles River and its tributaries. The trash floating at the river's mouth in Long Beach can be so thick that it is hard to see any water. In the unusually wet winter of 2005, Long Beach hauled more than 12,000 tons of garbage out of the river. Much of the trash winds up in the Pacific Ocean, contributing to huge floating garbage patches. Pieces of plastic can wrap around wildlife and kill birds and fish. Trash was formally identified as a pollution problem in the river in 1996. Five years later, the regional water board adopted standards. But 22 cities sued to overturn the trash limits, saying they would be expensive and difficult to meet. The courts found the board had not performed an adequate environmental impact analysis of the new rules, but otherwise upheld them. After conducting an environmental review, the board readopted the trash standards in 2007. In the meantime, some cities in the watershed, including Los Angeles, started installing screens and collection systems to keep street debris from washing into sewers. Sixteen cities in the watershed recently received $10 million in federal stimulus money to outfit their catch basins. Local officials pointed to progress Thursday. "We have taken trash reduction seriously," said Signal Hill Councilman Larry Forester. Another official showed the board photographs he took after Monday's storm. Parts of the river that have been coated with trash in the past were largely clean. Local representatives argued that it wasn't necessary to write a target of zero trash discharges into the storm permits, and that doing so would set a burdensome precedent for other pollutants. Three maps from the County of Los Angeles Department of Public Works identifying the eleven (11) facilities they maintain within the Sepulveda Basin. Please click the links below to view images of illegal fishing, swimming, dogs off leash (in the lake too), killing of birds, etc. regarding feasibility of Section 1135 projects in Haskell Creek, Woodley Creek, Hayvenhurst Creek and Encino Creek. Bull Creek Restoration: Native Plant Extraction, Salvage and Storage; Hydroseeding. South Fire Access Road, Sepulveda Basin Draft Environmental Assessment. Bull Creek Channel Ecosystem Restoration – Draft Detailed Project Report and Environmental Assessment. Burbank Boulevard Trunk Line Draft Environmental Assessment. Arundo and Exotic Weed Removal Within Bull Creek, Sepulveda Dam Flood Control Basin. Riparian Restoration Planning in Southern California – What's Missing? Keith B. Macdonald, Harold A. Wier, Julie M. Vanderwier and Michael U. Evans.